East Williston Board of Education President Mark Kamberg leads the year's fourth budget workshop. The East Williston Board of Education’s proposed 2019-20 budget would raise taxes by an additional $1.48 million from the current year’s budget, the board said in its fourth budget workshop meeting. If approved by the board and residents in a final vote, the new budget will increase by 2.89 percent to $61.7 million compared to the current 2018-19 budget that ends in July. The board said the larger budget will allow the district to continue its implementation of the 5-Year Strategic Plan, which is designed to improve services in four priority areas: STEM education, social and emotional learning, facilities and security, and real-world learning. The upcoming budget addresses year two of the five-year plan. Salaries and retirement expenses are by far the largest budget items, making up 58.4 percent of the entire budget. Employee benefits such as health insurance are the second-largest budget item, making up a full 19.1 percent. That leaves 22.5 percent left over for special education (3.9 percent), facilities upkeep (4.3 percent), BOCES (3.1 percent) and all others school district budgetary expenses. The Financial Advisory Committee said it supports the proposed budget and noted in a presentation that employee benefits and transportation expenses increased significantly vs. the prior year, rising 4.4 percent and 3.7 percent, respectively. However, 67 percent of what drove up the costs are mandated by state and federal governments. Local governments must comply with state and federal health insurance, employee retirement, curriculum and bargaining terms, among other mandates. Higher enrollment helps lower per-student costs, estimated to be $35,082 compared to the prior year’s $34,566 cost per student. Student enrollment is expected to increase to 1,760 after reaching a trough in the 2016-17 school year of 1,683. The tax levy for the proposed budget will rise by 2.74 percent, the fourth-highest in 10 years despite still being compliant with the tax cap implemented by the state in 2012 and under the allowable tax levy growth of 3.41 percent. Interest rates are a major driver of the tax levy since there was zero growth in the 2016-17 school year levy when interest rates were still near zero. East Williston’s tax levy of 2.74 percent now is higher than the average Nassau County school district rate of 2.30 percent and higher than Garden City (2.08 percent), Roslyn (2.50 percent) and Oyster Bay (1.95 percent). Assistant Superintendent for Instruction and Personnel Danielle Gately presented the budget and details on what it would address in the four areas of student development in East Williston’s five-year plan. Gately said science, technology, engineering and math classes, known as STEM, will continue to expand with Project Lead the Way, which are engineering courses that teach real-world skills, critical thinking and collaboration. The department will also continue the installation of an additional 30 flat screen panels. The social and emotional learning budget will include more money for teacher development in a Responsive Classroom, an approach that integrates academic with emotional skills. There will also be a new full-time social worker at Willets Road and an additional full-time teacher for North Side. 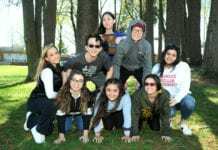 “We are looking to continue expanding our role in students’ lives, in enriching their lives socially and emotionally and supporting them as they grow,” said Gately. Real-world learning programs will help students prepare for life after high school and college. Budgeted are new family and consumer science courses at the Wheatley School, such as financial literacy, and an expanded advanced placement offering. Also included are field trips and academic competitions, among others. The Educational Advisory Committee, which makes recommendations and reviews academic plans among other oversight items, supports the budget proposal and believes it will make students more competitive. 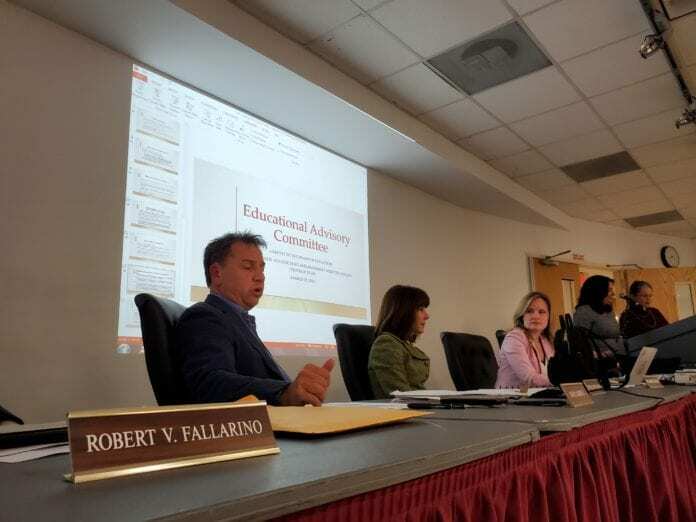 “That’s our recommended budget and we feel that it addresses year two of the five-year strategic plan priorities,” said Gately, who is a member of the Educational Advisory Committee. “It continues to support ongoing educational and social and emotional programs.” Gately also noted the budget accomplishes its goals while operating under the tax levy cap. For facilities and security, roof repairs, bathroom upgrades and other maintenance items are budgeted for North Side, while Willets Road will be getting new air conditioners. Wheatley will receive a lighting upgrade in several internal and external areas, new air conditioners and auditorium renovations, among other maintenance items. Along with the budget, there will be several propositions given to the public for a vote. One is to support expending $1 million from previously approved capital project reserve funds for tennis court renovations and a proposition to spend $3.9 million on renovations of Wheatley Fields and the gymnasium flooring. The board will also propose to establish new capital reserves of $6.5 million over seven years that will be used to undertake several projects, like replacing roofs, door replacements and lab renovations, among others. This was the last budget workshop. It will be finalized during final deliberations rescheduled for April 1 with a final vote given to the public to approve or deny the proposed budget May 21.